XPUHI, Campeche – The 180 members of the 31st Ruta BBVA expedition had their prayers answered when Chaak, the Mayan deity of rain, unleashed his fury with lightning and thunder over the Calakmul archaeological site, located 1,210 kilometers (752 miles) east of Mexico City, EFE news agency reported. 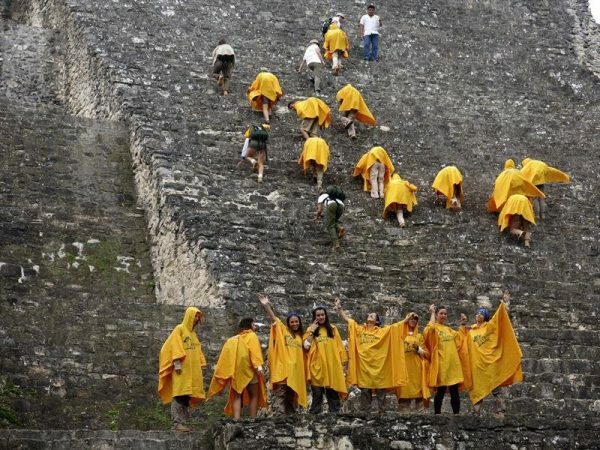 Members of the expedition, whose theme this year is “Aventura en las selvas mayas de Yucatan” (Adventure in Yucatan’s Mayan Jungles), will continue exploring until July 15, when they will travel to Madrid and tour Spain’s Extremadura and Andalusia regions. The academic-cultural project, whose participants come from 17 Ibero-American countries, was created in 1979 by reporter and adventurer Miguel de la Quadra-Salcedo based on a proposal by King Juan Carlos I, with the goal of building an Ibero-American youth community. The thunderstorm caught up with the group as they listened to tour guides and prepared to climb the steep steps of Buildings 1 and 2, the most emblematic in Calakmul, a place whose name means “dream awake” and is located amid lush vegetation, muddy trails, howler monkeys and yellow butterflies. “If I have to die, let it be in the Mayan jungle,” Abigail Felix, an explorer from Monterrey, Mexico, said while the rest of the group recovered after witnessing a nearby lightning strike. In terms of size and political relevance in the lowlands, Calakmul, the main Mayan city in what is now Campeche state, rivaled Tikal, located in present-day Guatemala, for two centuries. In the 6th and 7th centuries, Calakmul dominated the whole region, produced innovation in many areas and established trade, client or war relations with surrounding population centers, among them Tikal, Andres Ciudad, deputy director of Ruta BBVA and a professor at Madrid’s Complutense University, said. Tikal, less than 30 kilometers (18 miles) to the south, “was able to change the balance and Calakmul gradually lost importance forever,” Ciudad said. The abundance of stelae, which Ciudad described as “the main political propaganda item in Maya sites,” distinguishes Calakmul from all other Mayan cities, with 120 of the stone monuments already discovered. The stelae, carved in limestone and now erased by erosion, describe the history of the city’s dynasties; however, because of the deterioration of the monuments, more is known about Calakmul from accounts about the city in other areas. Tikal and Calakmul “were twin cities, watching each other with vigilance, and changes happening in one of them were quickly absorbed into the other one,” Ciudad said. At the height of its glory, Calakmul had some 80,000 inhabitants, compared to 65,000 in Tikal.